On Friday, James was presented with the 2019 National Weatherperson of the Year award from the Federal Alliance for Safe Homes (FLASH). Mr, Dominic Sims of the International Code Council, a FLASH Board Member, presented a plaque to James at ABC3340. He was accompanied by Joy Beth Smith, the Executive Administrator and Segment Manager for the International Code Council, which is based in Birmingham. 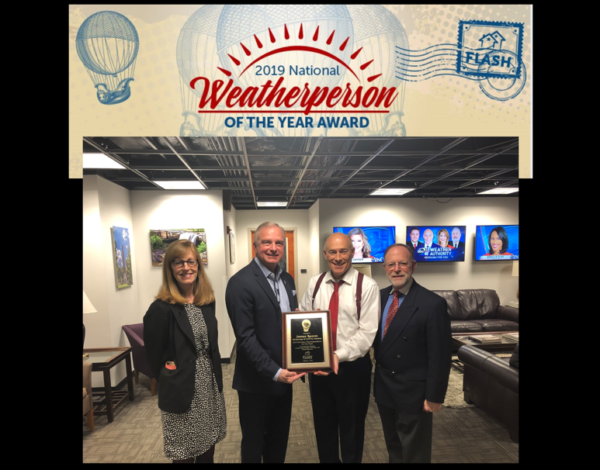 (TALLAHASSEE, FL) – The Federal Alliance for Safe Homes (FLASH)® named James Spann as the 2019 National Weatherperson of the Year on Friday. Mr. Spann is widely respected by his peers for scientific excellence, cherished in his community by students and teachers alike, and now honored by the disaster safety movement for protecting families and homes from severe weather. He is the Chief Meteorologist at ABC 33/40 – Birmingham, AL. “James Spann is a weather king, a meteorological genius, dedicated family man, and all while putting the safety of his viewers front and center. Spann is the man for more than just saving lives in big events, he spreads joy and weather awareness everywhere he goes. He inspired me to be who I am today and is still my number one mentor.” – Ginger Zee, Chief Meteorologist – ABC News. Tweeter” multiple times over the years. He has also been named “Best Weather Anchor” in Alabama by the Associated Press, and winner of the Alabama Broadcasters Association ABBY Award for “Best Weathercaster in Alabama” many times over his long career. Additionally, James was one of the first weather anchors in the nation to earn “Certified Broadcast Meteorologist” status from the AMS. He holds a certificate in broadcast meteorology from Mississippi State University and an honorary Doctor of Laws degree from the University of West Alabama. National Weatherperson of the Year is an annual honor that recognizes an outstanding weatherperson for leadership in promoting disaster safety and resilience. The finalists and winner are selected based on public polling as well as qualitative evaluation. The nonprofit Federal Alliance for Safe Homes (FLASH) is the country’s leading consumer advocate for strengthening homes and safeguarding families from natural and manmade disasters. The FLASH partnership includes more than 100 innovative and diverse organizations that share a vision of making America a more disaster-resilient nation including: BASF Corporation, FEMA, Florida Division of Emergency Management, Huber Engineered Woods, International Code Council, National Weather Service, Portland Cement Association, Simpson Strong-Tie, State Farm, and USAA. In 2008, FLASH, and Disney opened the interactive weather experience StormStruck: A Tale of Two Homes, in Lake Buena Vista, FL. Learn more about FLASH and access free consumer resources by visiting www.flash.org, calling toll-free (877) 221- SAFE (7233), following @federalalliance on Twitter, on Facebook.com/federalalliance, and the FLASH blog – Protect Your Home in a FLASH.